Hello. Thank you for calling Dial-A-Horticulturist where our motto is "gardeners rule". How may I direct your call? I'd like to speak to someone about common plant names, please. Certainly, please hold while I direct your call. Our current wait time is 10 minutes as this is our busy season. While you are on hold, you will hear the sounds of a garden - bees buzzing, birds singing, and water gurgling. Hello, this is Hortense Hoelove in Common Plant Names. How may I help you. Hortense? The Hortense who wrote a gardener's advice column? That Hortense. Yes, that Hortense. How may I help you this evening? Wow, I'm excited to actually talk to you, Hortense. So excited, I almost forget my question. Oh, wait. I remember. Is there a common name for Clematis x triternata 'Rubromarginata'? Hold please, while I check. While you are on hold, you will hear the sounds of a garden - bees buzzing, birds singing, and water gurgling. Thank you for holding. I've looked it up. I don't see a consistently used common name. Would you like to suggest one? Oh, daisies, would I ever. I'd like to suggest Fairy Vine. Thank you, again, for holding. Though Fairy Vine has been used as a common name, we here at Dial-A-Horticulturist do not see harm in using it for Clematis x triternata 'Rubromarginata'. We'll add it to our files. Oh, thank you. That seemed pretty easy. Can we change it to Carol's Fairy Vine? Sure. We'd be happy to update our records. Please hold while I take care of that. While you are on hold, you will hear the sounds of a garden - bees buzzing, birds singing, and water gurgling. Thank you for holding. We've updated our records to indicate that a common name for Clematis x triternata 'Rubromarginata' is Carol's Fairy Vine. Please keep in mind that we cannot guarantee that this plant will not have other common names. 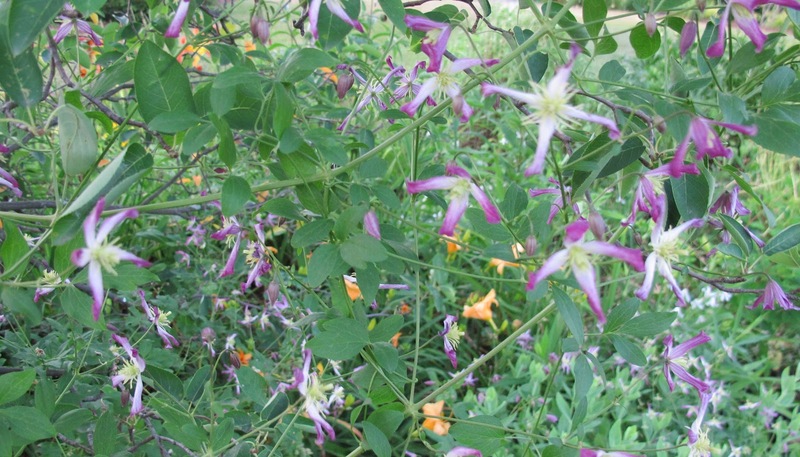 Nor can we guarantee that Carol's Fairy Vine won't be used for another plant in the future. Is there anything else I can help you with? No, that should do it for now. Thank you. My pleasure. Thank you for calling Dial-A-Horticulturist where our motto is "gardeners rule". 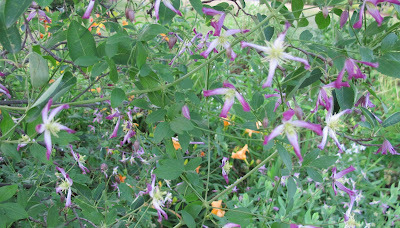 Clematis x triternata 'Rubromarginata', commonly called Carol's Fairy Vine scampers in the branches of a serviceberry tree. LOL...and what a lovely name to accompany a pretty vine. Wonderful post *giggling* glad you got your name it's lovely! Carol, you have a very fertile mind. So funny. I love this entry. It is a beautiful plant and a perfect nae for it. That's a very lovely plant. Thank you for introducing it to me. Now to find out if I can grow it. Hahaha, i love this post, i am sure everybody laughed or smiled and entertained. You are a good writer of fun posts, you should do this more often, a very good story teller, almost real. We can make it real, hahaha!